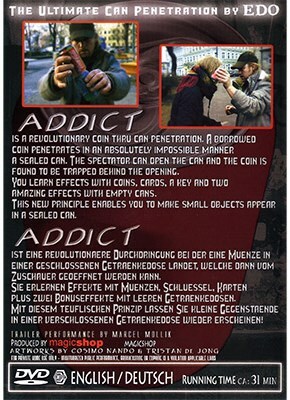 Addict is a revolutionary coin thru can penetration. A borrowed coin penetrates in an absolutely impossible manner a sealed can. The spectator can open the can and the coin is found to be trapped behind the opening. You learn effects with coins, a key and two amazing effects with empty cans. This new principle enables you to make small objects appear in a sealed can. • The can is "shown" and shaken to be empty at the beginning. This can also be done by the spectator. • The spectator can examine the can exactly. • After the penetration the spectator shakes the can and hears clearly the coin inside the can. • The spectator opens the can and empties it himself. • The spectator finds the coin or other object inside the can. • The object (coin, key, cards ...) can even be taller than the opening of the can, so that the can has to be cut to get the trapped object. • The can can be held by the spectator from the beginning to the end of the effect! • The impossible happens right in the hands of the spectator! • Everything can be examined anytime! • The can even can be given as a souvenir with the trapped object inside the can! The effect itself is already a completely stunning and an unexplainable miracle! And than even in the hands of the spectator! This is the ultimate can penetration!